Andrea began working at the Skagit Watershed Council in Spring of 2018 as the Community Engagement Coordinator. She earned her M.Ed. from Huxley College of the Environment and the North Cascades Institute in 2014 as well as a Certificate in Nonprofit Administration and a Northwest Naturalist Certification. Andrea brings her experiences in curriculum development, teaching to state learning standards, formal and informal education within school districts, and marketing to the Skagit Watershed Council. 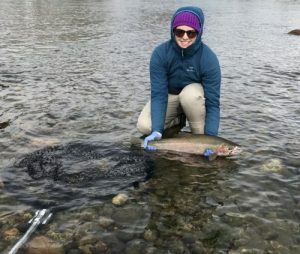 She grew up in Washington State along the shores of the Snohomish River, Skykomish River, Stillaguamish River, and the Salish Sea which helped develop her love for the outdoors and water. Andrea now resides in Bellingham, WA where she enjoys outdoor adventures including skiing, hiking, sailing, diving, and traveling.